Thought Balloons - Creating Comics One Page At A Time: Why Nightcrawler? Because teleportation is a fun power to get to play with. Ok perhaps that is a slightly simplified answer but it’s the one that instantly springs to mind. Teleportation is a great storytelling device to play with (despite what movies like Jumper may have taught us!) and I want us here at Thoughtballoons, and any writers who want to join us at home to prove. 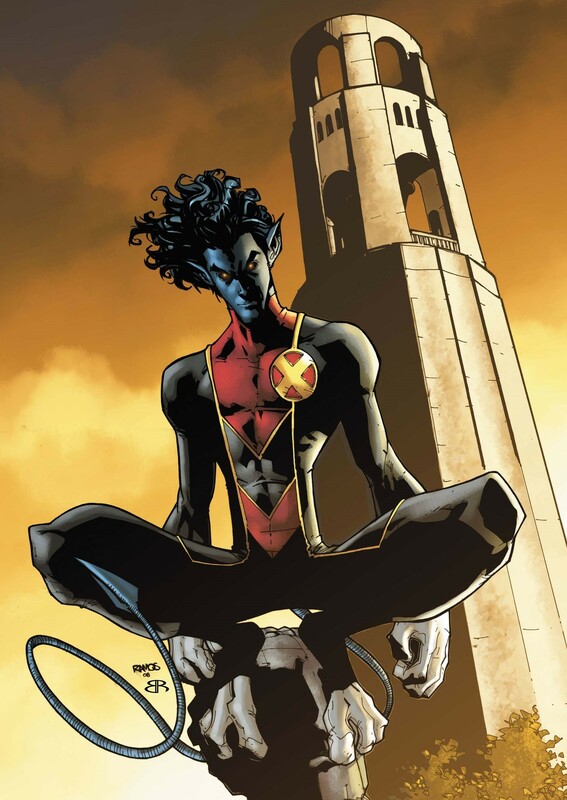 Nightcrawler or has his friends know him Kurt (Wagner) also possesses superhuman agility, and adhesive hands and feet. However he is in fact for more than just a cool set of powers. As an X-Men fan for years I have always had a lot of love for Nightcrawler. He was always a happy go lucky and fun character to read about, despite being a mutant, who like fellow X-Man Beast had to wear this fact on his sleeve due to the physical manifestation of his mutant DNA. His skin has a purple hue to it, in addition he has two-toed feet and three-fingered hands, yellow eyes, pointed ears, and a prehensile tail, so quite a lot to deal with. In spite of this outward mutation Kurt has used it to become a character who can’t hide from who truly he is, this juxtaposed with his ability to teleport anywhere makes for a rather complex character who in the face of mutant hatred must be happy in himself. This makes for some compelling storytelling. What's more as practicing German Catholic, Nightcrawler has even more layers to him that are such as his relationship with religion and god in the face of being a mutation which are themes just ripe to be explored. When you add to this melting pot of character traits his mother Mystique and father Azazel, Nightcrawler makes for a character that draws vast portions of the Marvel X-Men universe together. So, where will your story take the mutant who can go anywhere? I leave you with words from the man himself. Labels: Nightcrawler, Shaun Richens, Why, Why? Close up of a feminine pair of yellow eyes upon a blue face. The eyes appear sleepy. CAPTION: People say there's a smell of brimstone when I 'port. CAPTION: I can't say I smell it any more. Mid-shot, from above, of Nocturne (Nightcrawler's daughter from Earth-2182) laying in bed, sheets up to her armpits. There are faint wisps of pink smoke creeping into the bottom of the panel. CAPTION: The sound is unmistakable. Wide view, revealing Nocturne's bedroom filled with pink smoke. She has risen up on her elbows, looking into the cloud. Close up of Nocturne's face. She is in shock, covering her mouth. Her eyes are welling up a little. Same angle as Panel Three, except the smoke has cleared (mostly). Nightcrawler is hanging upside-down from the ceiling fan by his tail, smiling. Around him, the room is filled with boxed gifts. There is a big sign across the back wall reading, "HAPPY BIRTHDAY". That opening panel felt a little dark with the talk of brimstone then you build up so very nicely to the curve ball ending which is in and of itself a great image and wonderful beat to go out on. Fun page and lovely use of Nightcrawler's power and character to tell a sweet little story. Sweet story. I loved the multiple Bamf's (sounds dirty when I say it back to myself) and the reveal in the final panel. Dan! Glad to see you around these parts, especially when you bring such a heartwarming Nightcrawler script with you. Keep well. At the top of a building, Kurt, who has his back on us, is silently observing the people in the sidewalks bellow him. It is night time and the street is lit up by street lamps and by the lights emanating from the various shops and whatnot in the area. Kurt is wearing a dark hood that is covering his head, and his tail is clearly sticking out of his back. A small cloud that is almost dissipated is in his vicinity. CAPTION (Kurt): Maybe I'll never be like them. Basically the same view as Panel 1, but in a different building and in a different street. Also, in this panel, it is raining, so the people are either carrying various colors of umbrellas or putting a suitcase in their heads and running. The cloud of smoke in Kurt's vicinity is relatively bigger than in the previous pannel. Still in the same view but, again, a different building and a different street. It is around 5pm so the sun, seen on the left side of panel, is setting. The building is much higher than the previous panels, and covers a busier street, with busier people who are mostly wearing suits and other business attires. Also, the cloud of smoke is relatively bigger than Pannel 2. Close-up on the lower half of Kurt's face and he is smiling. We are inside the TV area of the X-Men headquarters. Kurt had just tapped(annoyingly) Logan's shoulder and teleported. Logan is furious and is looking back at his shoulder. KURT (the speech bubble is connected to the puff of smoke): Hee-hee-hee-hee-hee! CAPTION (Kurt): And being me is certainly fun! I really dig this. You build up this tense and seemingly sad moment of self reflection for Nightcrawler looking down on 'normal' life. Then you pull a twist on the audience and end on this uplifting beat of Nightcrawler seeing that he can be happy as he is. Fine work here.